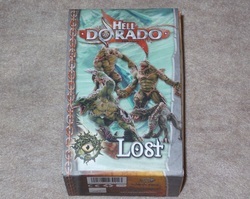 This time out I'm here to take a look at another one of the starter sets available for the HellDorado skirmish game, which itself has been re-branded under the Cipher Studios banner. 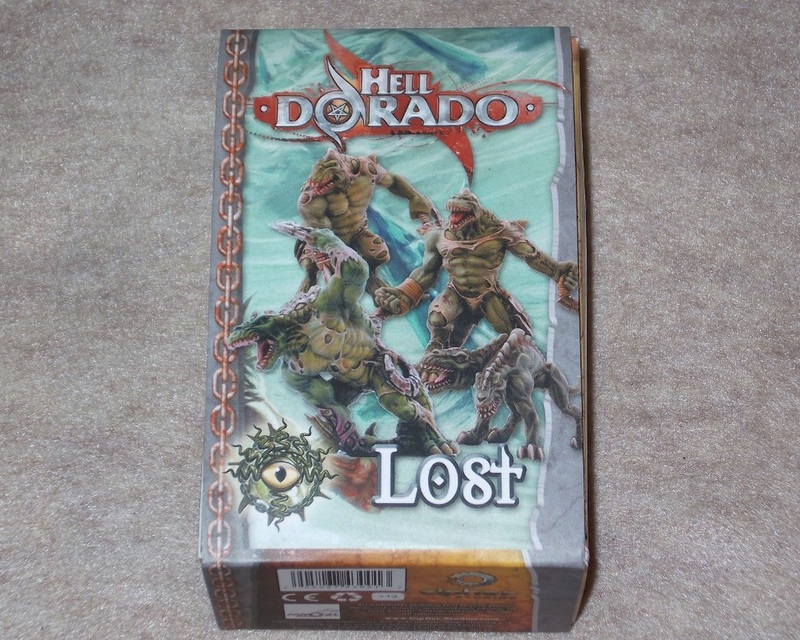 For those of you who aren't familiar with Helldorado, it's a skirmish game formerly released only in France by Asmodee Editions utilizing 32mm scale models, and it was very popular in Europe. Now Cipher Studios in the US have the license and have re-branded the entire line of models, and has a new rulebook in English coming out in December. In addition to re-releasing the original range of models, Cipher is also in the process of creating all new models, adding to the range as well. The set I review today is the set based on the faction called Lost. I'm a little confused by this set, because the fiction defines them as damned lost souls, who have lost, or abandoned their demonic overlord. However they look like humanoid-like lizards or dinosaur-like humanoids. I guess they could pass for some sort of demon, but dinosaurs and lizards is what I'm seeing first and foremost here. On the box top imagery it's hard to tell if they're shedding skin or simply turning from human flesh into dino-reptiles. So they're either shedding their skin like a reptile, or ripping out of it through some transformation of some sort. Since it's more fun to believe it's the later, that's the theory I subscribe to, and it's how I've painted them. Some of the other sets come with 5-6 models, but in this set the models are quite a bit larger, this set comes with just four models in the box. In the box you've given a large double sided sheet of paper with the starter set rules, four full color stat cards for the models, and two thick pieces of foam sandwiching the pile of model parts keeping them safe. After seeing the Westerners Starter Set I wasn't expecting these to be very clean of flash and mold lines, but to my surprise these were a little bit cleaner. Some of the mold lines are rather thick, but I was able to get them cleaned up and assembled a lot faster than what it took to prepare the Westerners models. Due to these being larger models, the parts are thicker and larger overall, and all metal just the same, so you might want to pin them during assembly. With minor filling I was able to get the majority of the parts to fit nicely. Okay be prepared for some names that you'll never be able to pronounce! Actually due to the font used on the stat card, don't be upset with me if I spell these wrong too. In the set you are given two models to represent Sqvamata Warriors. This I thought was a nice touch, because while the stat cards show the same model, there's two completely unique models to represent them on the table. Both of the Sqvamata Warrior models have a bladed wolverine-like claw in their right hand, with a circular-like bladed weapon being held in their left hand. The poses are what separates the two models, as one of them is standing arms stretched out in a “come and get some”-like pose, while the other is leaning forward poised to strike. Both of these models come as a body, a right arm, left arm and a head, and a 40mm round lipped display base. These are thick white metal pieces, so pinning is probably a good idea. If and when I can get away with not pinning models I do, and with these I just used standard medium viscosity CA, and so far I've had no problems with them. For the most part the pieces go together nicely, with minor filling to fit. The Fangs of Pit model is the smallest model in this set, and it looks like a two headed canine, but with heads that match the other models. So picture a dual headed animal on all fours, but with two dinosaur/lizard-like heads. It's a two piece model, and it comes in two halves. You simply glue the two halves together, and then cut away one of the slots from one of the sides, and then you can glue it to the included 40mm round lipped display base. You might need some green stuff for the tiny gap left, but I had no problem with using just gap filling glue, and once I primed it the gap was no longer visible. The fourth and last model is called Isha-Akshay the Sqvamata Warchief. He's the largest of all the models, and he comes as a body, right arm, left arm, and left hand holding the circular-like bladed weapon. Actually the circular-like blade that three of these guys wield reminds me of the weapon used in the Predator movies, but a more primitive-looking version. Almost every one of these Lost models are impressive. Each of sculpts offer an amazing degree of crisp detail. These are also some of the largest models I've seen in this range yet, and each one come with 40mm bases due to their size. There's actually more white metal in this set, than there is in the Westerners set by far, and it carries the same $29.99 USD price tag as the Westerners Starter set. If any one of the three largest models were a GW model you can bet they'd cost $20 each too. At $30 for these four models, plus the starter set rules to play with them right out of the box.. that's quite an acceptable price-point.